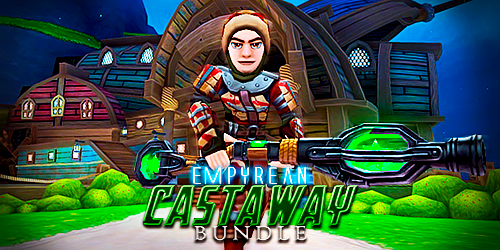 A brand new Wizard101 game card is available in stores now: the Empyrean Castaway Bundle! You'll find this all new game card at GameStop stores across the United States, for $39. US residents can buy it online, directly from the GameStop website. The Castaway's Bungalow is a large mansion, lost in the skies of Empyrea. This stormy deserted island offers plenty of space for avid decorators, a PvP Arena and your very own bartender. You'll also find a 'Lost & Found' box, with daily rewards! The Junk-Copter Mount is the result of the finest Empyrean engineering. 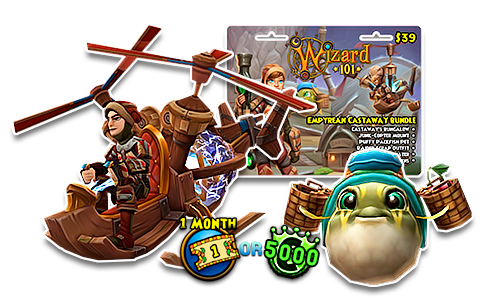 This ride grants a 50% speed boost to your Wizard, making it one of the fastest mounts in the Spiral! The adorable Puffy Packfish Pet gives a Vengeance card at Baby, with a starting pedigree of 68 and good stats for a first generation pet. The Raider Scrap Outfit goes up to Level 120 and gives great overall stats to your Wizard. The Raider Scrap Blaster Weapon grants your Wizard 7% universal pierce, 95 critical rating, 5% universal damage, 1 power pip, 205 pip conversion rating, a Square jewel socket and Maycast Dragonspear at Level 120+.